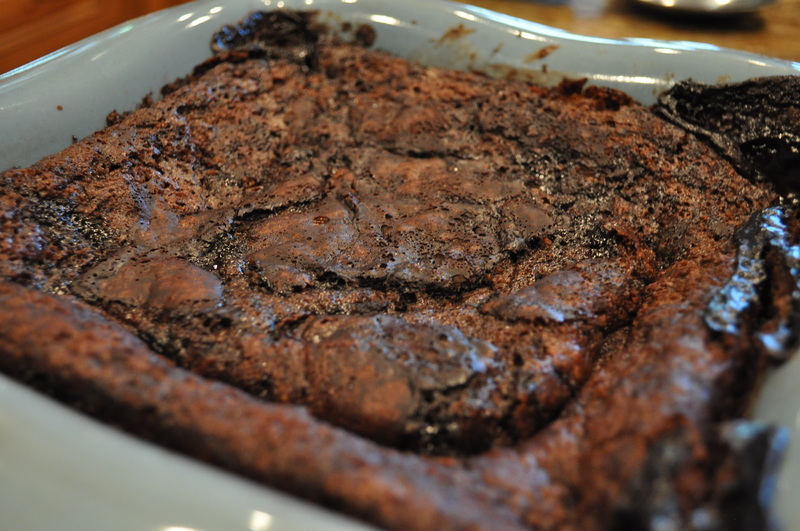 I found this recipe on Pinterest (it is called My Granny’s Chocolate Cobbler by Sooz Hawkins) and you can find it here. Preheat the oven to 350 degrees. Combine the flour, baking powder, salt, 3 tablespoons cocoa powder, and 3/4 cup of the white sugar in a medium size bowl. Melt the butter and add it to the dry mixture along with the milk and vanilla. Stir until smooth and pour mixture into an ungreased 8 inch baking dish. In a separate bowl combine the remaining white sugar (1/2 cup), brown sugar, and the remaining cocoa powder (4 tablespoons). Sprinkle this mixture over the batter. Pour the hot tap water over all of the batter. DO NOT STIR (this step is crucial in achieving gooey chocolate goodness). Bake for 40 minutes or until the center is no longer jiggly. We served ours with ice cream, but it can definitely be eaten on its own or with whipped cream or vanilla Greek yogurt.